^ a b "America." The Oxford Companion to the English Language ( ISBN 0-19-214183-X). McArthur, Tom, ed., 1992. New York: Oxford University Press, p. 33: "[16c: from the feminine of Americus, the Latinized first name of the explorer Amerigo Vespucci (1454–1512). 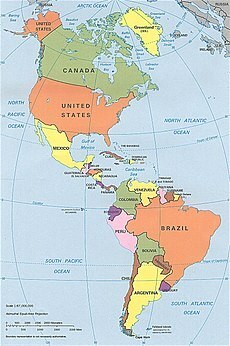 The name America first appeared on a map in 1507 by the German cartographer Martin Waldseemüller, referring to the area now called Brazil]. Since the 16c, a name of the western hemisphere, often in the plural Americas and more or less synonymous with the New World. Since the 18c, a name of the United States of America. The second sense is now primary in English: ... However, the term is open to uncertainties: ..."
^ Burchfield, R. W. 2004. Fowler's Modern English Usage. ( ISBN 0-19-861021-1) Oxford, UK: Oxford University Press; p. 48. ^ a b c d "America." Oxford Guide to Canadian English Usage. ( ISBN 0-19-541619-8) Fee, Margery and McAlpine, J., ed., 1997. Toronto: Oxford University Press; p. 36. ^ Reader's Digest Oxford Complete Wordfinder. 1993. ( ISBN 0-276-42101-9) New York, USA: Reader's Digest Association; p. 45. ^ "American." The Oxford Companion to the English Language ( ISBN 0-19-214183-X); McArthur, Tom, ed., 1992. New York: Oxford University Press, p. 35. "Americas". Encyclopædia Britannica, 15th ed. 1986. ( ISBN 0-85229-434-4) Chicago: Encyclopædia Britannica, Inc.
Fee, Margery and McAlpine, J. 1997. Oxford Guide to Canadian English Usage. ( ISBN 0-19-541619-8) Toronto: Oxford University Press. Pearsall, Judy and Trumble, Bill., ed. 2002. Oxford English Reference Dictionary, 2nd ed. (rev.) ( ISBN 0-19-860652-4) Oxford, UK: Oxford University Press.